A Little bit of chain mail has been spreading through the beauty blogging world as of late. 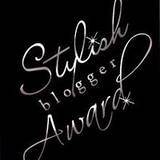 The stylish blogger award. In The Pink Of Things (thank you) tagged me so I am going to pass along the love and follow the rules and continue on the chain. Tell us seven things about you. Award seven recently discovered new bloggers. I don't drive, never have, probably never will. I am so the product of living in a city with transit and parents that didn't to encourage me to learn to drive. I love kitchen gadgets. I am a foodie at heart and love kitchen gadgets of all shapes and sizes. I try not to buy uni-taskers too much though. I got attacked by a dog when I was 3 or 4 and have scars on my face from it. Surprisingly I knew it was my fault and still love dogs. Toy Story 2 makes me cry every time. That darn Sara Mclaughlin song about when Jessie was loved makes me think of my cat Shine who was dumped at my vet, who does that? I am a sucker for things like that. I've been dying my hair off and on since I was 10. I was blond until 10 and then it went dark, so we dyed it to keep it blond. Now I sport red hair. I have become obsessed with buying things with butterflies on them ever since getting a papillon (butterfly dog). It is sad. Someone somewhere got the idea I collect tea pots and now I have about 15. I don't know where it came from or how it started...I don't even really like the idea.